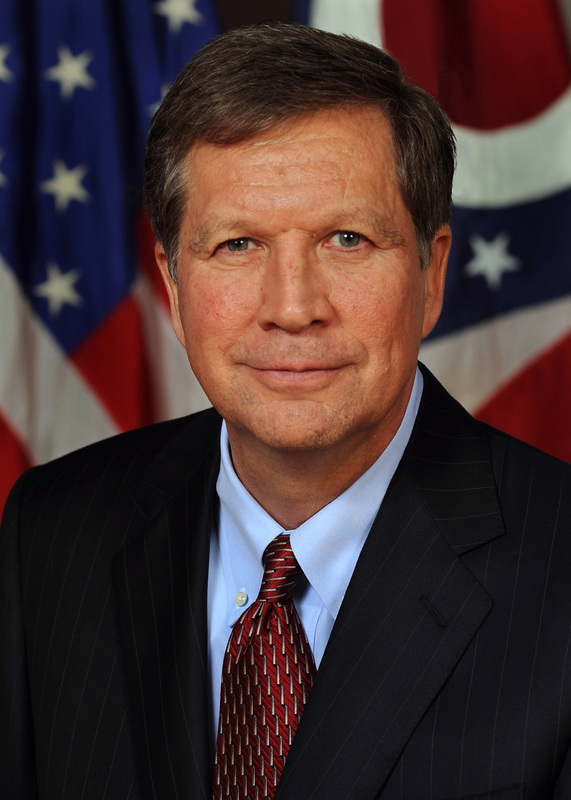 John R. Kasich, the 69th Governor of Ohio, is a candidate for the Republican Party's nomination to the 2016 presidential election. Kasich served in the Ohio Legislature first as an aide to Ohio State Senator Buss Lukens (a former State Chair of the American Legislative Exchange Council), then as a Senator himself (1978-1982); he also served as a U.S. Congressman (1983-2001). Kasich was elected Governor of Ohio in 2011. He is credited by the American Legislative Exchange Council (ALEC) as someone "who helped mold ALEC in its formative years." Kasich also worked for the Wall Street investment firm Lehman Brothers in the years leading up to the 2008 financial crisis. Kasich made an unsuccessful presidential bid in 2000 and was a Fox News host with his show Heartland with John Kasich from 2001 to 2007. John Kasich's super PAC, New Day for America, raised over $11 million in less than 3 months between April and July, 2015. "Kasich’s super PAC haul places him in the middle tier of candidates, behind Jeb Bush ($103 million), Ted Cruz ($37 million), Scott Walker ($20 million), Rick Perry ($16.8 million), and Marco Rubio ($16 million). Chris Christie’s super PAC has also reportedly raised around $11 million." According to CNN, "Kasich joined Lehman's investment banking division as managing director in 2001, working there until the firm's collapse in September 2008 unleashed global panic and served as the catalyst for the financial crisis." Kasich's past work at "arguably the most deeply vilified Wall Street firm," as CNN notes, "is likely to serve as rich fodder for political attacks" in the 2016 election cycle. In addition to engaging in risky derivatives trading including credit default swaps, Lehman Brothers experienced unprecedented losses in the mortgage crisis. Lehman held on to large positions in subprime and other lower-rated mortgage tranches while securitizing the underlying mortgages leading to huge losses accrued in lower-rated mortgage-backed securities throughout 2008. In the second fiscal quarter, Lehman reported losses of $2.8 billion and was forced to sell off $6 billion in assets. In the first half of 2008 alone, Lehman stock lost 73 percent of its value as the credit market continued to tighten. In August 2008, Lehman reported that it intended to release 6 percent of its work force, 1,500 people, just ahead of its third-quarter-reporting deadline in September. By September 2008, when Lehman Brothers declared bankruptcy, housing prices had already dropped 22 percent from the peak. Prices fell another 12 percent in the six months after Lehman collapsed. For more information, see the SourceWatch article Lehman Brothers. Kasich is credited by the American Legislative Exchange Council (ALEC) as someone "who helped mold ALEC in its formative years." The public interest group ProgressOhio wrote a report in 2012 called "ALEC in Ohio." From the report, "Kasich has not only signed a number of ALEC-influenced bills into law, he also introduced major initiatives in his 2011 State of the State address that were similar or identical to ALEC proposals taking root in other states. For example, weeks before Kasich announced his prison privatization proposal on March 15, 2011, Louisiana Gov. Bobby Jindal, ALEC’s 2011 “Thomas Jefferson” Freedom Award winner, introduced a very similar measure. As a result of Kasich’s measure, Ohio’s Lake Erie Correctional Institute was bought by Corrections Corporation of America (CCA), which had spent two decades sitting on ALEC’s Public Safety and Education Task Force, an ALEC body which approved numerous model bills to privatize prisons and increase sentences. (The company, which has benefited enormously from ALEC’s privatization efforts, claims it is no longer on that task force as of late 2010, after critical reports about its extensive role in ALEC surfaced earlier that year.)" Some of ALEC's prison privatization bills include: Private Correctional Facilities Act and Prison Industries Act. Kasich promoted amending the U.S. Constitution with a balanced budget requirement with a six-state tour in 2015. A balanced budget amendment has long been an ALEC priority and was on the agenda at the 2015 ALEC annual meeting in San Diego. See ALEC's Balanced Budget Amendment Resolution. On March 31, 2011, Governor Kasich signed Senate Bill 5 into law, eliminating public employee collective bargaining rights. The bill was later rejected by voters and overturned by a state-wide referendum and Kasich accepted the defeat saying "the voters have spoken.". In later years, Kasich's support for development initiatives, including $1.5 billion in debt backed by Ohio Turnpike tolls for infrastructure, won him some union support for his 2014 re-election, according to Bloomberg. And Kasich did not pursue ALEC "Right to Work" and other anti-union policies as did Wisconsin and Michigan. "Kasich and Republican legislators that supported Senate Bill 5 received $563,000 in campaign contributions from ALEC corporations in 2010. And, last year , an investigation by Truthout revealed that ALEC companies such as Walmart and Coca-Cola quietly funneled tens of thousands of dollars into front groups like the Republican Governors Association to support Kasich's election in 2010." ALEC climate change denial policies have prompted dozens of high-tech firms like Google and even fossil fuel firms like Shell to drop the organization. Yet Kasich shares ALEC's hostility to renewable energy and says climate science is "not proven." After receiving over $200,000 in contributions from energy companies over two election cycles, Governor Kasich signed into law a freeze on energy use reduction targets, noted on ALEC's website as "a great victory for ALEC." In an August 2015 interview on Meet the Press, Kasich was asked if he believes that climate change is man-made and whether we should do something about it, he responded, "We don't want to destroy people's jobs based on some theory that's not proven." "Governor John Kasich has also pursued an extreme privatization agenda, using state liquor revenue to bankroll a privatized economic development agency. Taxpayers are losing out on millions in revenue each year, but the private agency is producing few jobs. He has also pushed prison privatization, creating Ohio's first private prison and serving up more maggots with prison food contractor Aramark. Further privatization of public schools is also on the menu in Ohio, where Kasich campaign contributor White Hat is busy evading open records and accountability and transforming public money into private assets in a controversial case before the state's Supreme Court." Learn more by reading the report Pay to Prey: Governors Facilitate the Predatory Outsourcing of America's Public Services. Ohio state education officials admitted in February 2016 that Ohio had almost ten times as many failing charter schools as the state initially claimed. The revelation came as Ohio was trying to retain a $71 million federal charter school grant in the wake of scandals over misleading the grant application reviewers and breaking state law by altering charter school performance statistics. That was the largest grant award by the U.S. Department of Education that year. The grant application was drafted by then-Ohio charter school chief David Hansen, who "resigned July 18, two days after submitting the grant request to the feds and several days after admitting he broke the law by excluding failing grades for some charter schools in the evaluations," as the Center for Media and Democracy reported. Hanson's wife, Beth Hanson, is former chief of staff for Kasich and as of February 2016 was the manager of Kasich's presidential campaign. Read more in the article, "Ohio Charter School Scandal Grows while John Kasich Ascends National Stage," on PR Watch. ALEC's library of bills includes dozens facilitating the privatization of public schools. The Center for Media and Democracy's 2014 report Pay to Prey, reviews the problems with Ohio's brand of charter school privatization. Ohio's charter schools are publicly funded, and they receive about $7,200 per student compared to about $3,500 per student in public schools. Oversight is provided by governing boards who hire management companies to run the schools. According to a 2014 report by the Center for Media and Democracy, "Oversight is impossible without transparency. But when the governing boards at ten Ohio charters run by White Hat Management tried to find out how the company was spending its budget, the company simply refused to provide detailed records, claiming that information about how it was spending taxpayer money was proprietary." The ten school boards sued White Hat in 2010, and the court found in the boards' favor. But when the boards demanded transparency, and a hearing was held in the Ohio House, White Hat refused to testify. When the boards said they would not renew White Hat's contract, "White Hat made the startling claim that it owned all assets purchased under its management, despite the fact that they were paid for with taxpayer money." Ohio Governor John Kasich received direct contributions totaling $45,580 from White Hat CEO Brennan and his wife, Ann, in 2010. As of 2015, Kasich was pushing to expand taxpayer funding to private and charter schools. See ALEC's The Innovation Schools and Districts Act. Since Kasich took office in 2011, the state of Ohio has increased spending on private school vouchers by 113 percent by 2015, even though many private schools do not outperform the public school districts. The state has also cut taxes for the wealthy while, according to Innovation Ohio's report on Kasich and education, "four out of ten school districts will see less state funding now than they did before Kasich." Kasich also targeted teachers using a senate bill that would have pulled collective bargaining rights from state employees if it weren't struck down by a citizens veto in 2011. "Given the controversy surrounding ALEC’s activities, Gov. John Kasich’s office has downplayed his extensive relationship to the organization. Rob Nichols, a spokesman for Gov. John Kasich, says the governor was formerly active in ALEC but stopped after leaving Ohio's legislature. The group's website says Kasich participated in the group during its formative years. Kasich’s spokesperson said that while the governor appreciates the group's work, he hasn't collaborated with it on recent legislation such as SB 5. While this may be technically true, it is far from a fair assessment of Kasich’s relationship with ALEC. An internal set of talking points created for an Ohio ALEC Scholarship fundraiser credits Gov. John Kasich as someone who “helped mold ALEC in its formative years.” Kasich’s influence is likely due to his unique history with the organization. In 1977, Ohio State Senator Donald ‘Buz’ Lukens took over the helm at ALEC and would go on to become its longest serving National Chairman. Lukens’ legislative aide at the time was John Kasich. If State Chair John Adams’ reliance on his legislative aide to perform extensive work on behalf of ALEC work is any guide, Kasich may have spent substantial amounts of time staffing the organization in its formative years before he would go on to win his own legislative seat and join the organization as a member. Kasich’s involvement doesn’t end with his time in the legislature. Kasich was recently photographed attending an ALEC meeting on December 1, 2010, where he is seen talking to private sector members." Kasich rejected food aid time-limit waivers from the US Department of Agriculture during poor economic times in 2013, only allowing 16 counties to receive the waivers, while the 8 counties containing 75 percent of the black population were left out. Kasich is requesting a waiver for 18 rural counties for 2016 while leaving out 12 qualifying cities with higher minority populations. The Kasich administration made deep budget cuts in 2012 and 2013 that punished local districts and governments. According to Policy Matters Ohio, "Health and human service levies were hit especially hard, losing 54 percent of state aid, on average. Impacts range from the inconvenient – curtailed hours at county buildings, reduced yard waste services – to the tragic." Although levels of unemployment and poverty remained high in 2013, the Ohio cash assistance program was not serving as many people as in 2011, before the Kasich administration. The decline in aid is due in large part to 'sanctions' that leave workers out who do not meet participation standards and many counties do not have the proper funding and infrastructure to help participants succeed. After Governor Kasich accepted Medicaid, Ohio's government is single-handedly funding a Medicaid expansion through 2016 that has already given coverage to over 360,000 newly eligible adults from January to August of 2014. The health care reform has given coverage to more working poor adults and early research has shown improvements in cost, care, and overall health. ↑ Carrie Dann, "Ohio Gov. John Kasich Announces He's Running for President," NBC News, July 21, 2015. Accessed July 27, 2015. ↑ 2.0 2.1 American Legislative Exchange Council, "ALEC History, organizational website, accessed July 22, 2015. ↑ 3.0 3.1 MJ Lee, "[http://www.cnn.com/2015/06/08/politics/john-kasich-2016-lehman-brothers-wall-street/ John Kasich's Wall Street ties could haunt 2016 bid}," CNN, June 8, 2015, accessed July 27, 2015. ↑ "Get to Know Governor John Kasich," NPR, accessed July 27, 2015. ↑ Daniel Strauss, "John Kasich Super PAC Raises More Than $11 Million," Politico, July 30, 2015. Accessed July 31, 2015. ↑ 6.0 6.1 Jenny Anderson and Eric Dash, "For Lehman, More Cuts and Anxiety," The New York Times, August 29, 2008. ↑ Edward L. Glaeser, "What We’ve Learned: Ugly Truths About Housing," New York Times, September 8, 2009. ↑ ALEC in Ohio, ProgressOhio, page 10-11, March 6, 2012, accessed July 22, 2015. ↑ Jonas Persson and Mary Bottari, "ALEC Wants to Educate High Schoolers on Balanced Budgets and Austerity," Center for Media and Democracy, PR Watch, May 28, 2015. ↑ Mary Bottari, "Ohio Voters Reject Kasich Anti-Union Bill," Center for Media and Democracy, PR Watch, November 9, 2011. ↑ Bloomberg News, John Kasich Charms Unions, April 15, 2015. ↑ Mike Ludwig, "Ohio Lawmakers Introduced 33 Bills Last Year Based on ALEC Model Legislation," Truthout.org, February 8, 2012. Accessed July 29, 2015. ↑ Elliott Negin, "ALEC Sharpens Attack on Environmental Safeguards," Center for Media and Democracy, PR Watch, December 29, 2014. ↑ American Legislative Exchange Council, "Digital Exchange 6-19-2014," ALEC website, accessed July 24, 2015. ↑ Clare Foran, "John Kasich Dismisses Climate Change As 'Some Theory That’s Not Proven'," The National Journal, August 9, 2015, accessed August 10, 2015. ↑ "Pay to Prey: Governors Facilitate the Predatory Outsourcing of America's Public Services," Center for Media and Democracy, October 15, 2014. Accessed July 22, 2015. ↑ Dustin Beilke, "[Ohio Charter School Scandal Grows while John Kasich Ascends National Stage," Center for Media and Democracy, PR Watch, February 18, 2016. ↑ 18.0 18.1 Center for Media and Democracy, "Pay to Prey: Governors Facilitate the Predatory Outsourcing of America's Public Services," report, October 15, 2014. ↑ Jim Siegel, "Kasich budget plan increases funding to all charter schools," The Columbus Dispatch, February 18, 2015. ↑ 20.0 20.1 20.2 Stephen DyerA Closer Look: The Kasich Record on Public Education, Innovation Ohio, August 6, 2015. ↑ 22.0 22.1 Policy Matters Ohio Left Behind: State of Working Ohio, organizational website, September 6, 2015. ↑ 23.0 23.1 Policy Matters Ohio Kasich-era tax changes reward wealthy," organizational website, August 27,2015. ↑ 24.0 24.1 Policy Matters Ohio Tax breaks expanded in state budget," organizational website, September 16, 2015. ↑ Josie Duffy,Gov. Kasich waives food stamp time limit for rural whites, forces urban minorities to go hungry, Daily Kos, September 22, 2015. ↑ Policy Matters Ohio Ohio deprives thousands of eligible residents of food aid,organizational website, August 26, 2015. ↑ 27.0 27.1 Policy Matters Ohio Intensifying Impact: State budget cuts deepen pain for Ohio communities, organizational website, November 13, 2012. ↑ 28.0 28.1 Policy Matters Ohio Shrinking aid for Ohio's poorest families, organizational website, November 21, 2013. ↑ 29.0 29.1 Policy Matters Ohio Medicaid expansion benefits Ohio, organizational website, October 21, 2014. This page was last edited on 11 October 2017, at 20:04.